For decades there has been a great deal of attention given to making cars safer, but what most drivers don’t know is that a small recorder present in most of today’s cars is keeping track of critical data in case of an accident. NBC’s Tom Costello reports. >>> there is mixed news tonight about the safety of some of the most popular small cars on the road. two honda civic models were the only compact or subcompact cars tested that got the top rating in front end crash tests from the insurance institute for highway safety . half of the dozen cars tested fared poorly, but the other six performed well. we posted the full list tonight on our website. >>> as those tests show, for decades it's been a great deal of attention on making cars safer. but what many drivers don't know is that in most newer model cars today, a small recorder is keeping track of critical data, just in case of an accident. that information is useful to police and insurance companies . but privacy advocates worry about who is allowed access to that readout about what you are doing behind the wheel. we get our report tonight from nbc's tom costello. >> reporter: at 50 miles per hour, a rare view of a crash test with a human behind the wheel. to learn how a car performed or to gather evidence in a real world crash, investigators are increasingly turning to a car's event data recorder , a black box . >> just got word that the governor's motorcade has been involved in an accident. >> reporter: when former new jersey governor jon corzine was seriously injured in a car crash , the black box helped determine his police driver was going 91 miles per hour and corzine wasn't wearing a seat belt . >> i apologize to the public. you know, i have no excuse. >> reporter: not unlike a commercial plane, the black box is usually buried deep inside the car. usually in the air bag control module where it monitors the car's speed, engine performance, whether the brakes are applied and seat belts buckled. 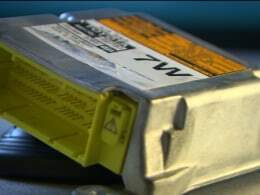 if the air bags deploy, the black box usually captures and records only the last few seconds of data before the crash. >> from a module like this, we'll see a little precrash data. how fast the car was going. the application of the throttle. >> reporter: crash specialist rusty hait travels the country teaching police officers how to use the information. >> accessing data from cars involved in a crash should be part of every accident investigation . it gives another data element to work with. it gives us something that's objective. >> reporter: pubuprivacy advocates warn there's no national standards on analyzing black box data and no word on who gets to look at the data about how you and i drive. >> in many states, insurance companies can access this information without your consent. law enforcement can access this information without first obtaining a warrant. >> reporter: but the boxes don't record video or sound, who is driving or even the road they're on. by september 2014 , the government hopes every new car will come with a black box . part of a focus on making cars and drivers even safer. tom costello, nbc news, washington.